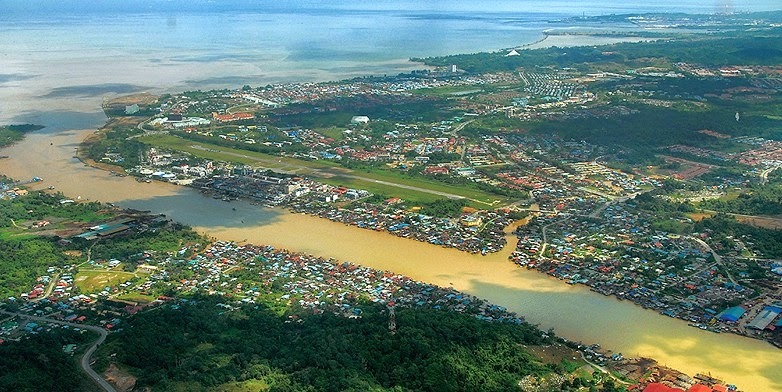 Two aerial views of Miri - above is view from sea to land, below is view from land to sea. 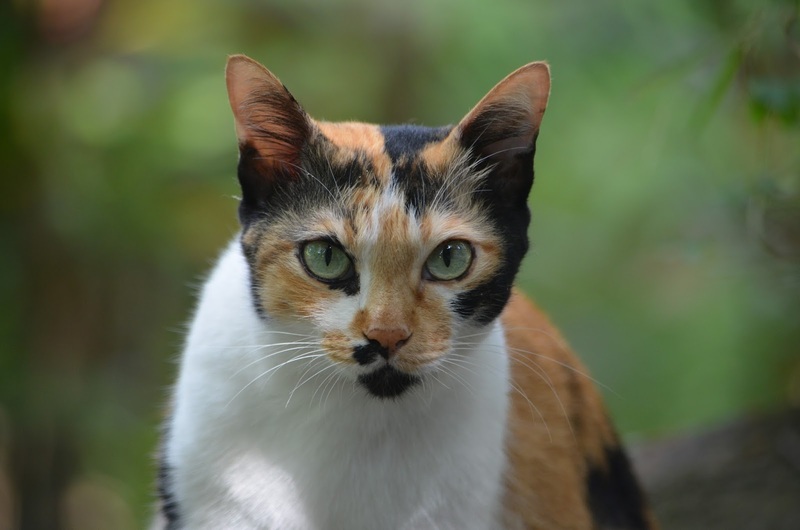 I have fond memories of Miri in two respects. First as a young student where I came to town in 1967 doing my Fourth Form studies at Tanjong Lobang School. At Tanjong I completed my Sixth Form education in 1970 at the age of 19. My school days at Tanjong was instrumental in moulding my adolescent personality and has resulted in some deep traits in me. I'll find time in future to write more on this very early influences in another blog here . It was only yesterday (1 Jan'16) that Sarawak was declared a toll free state with regards to usage of its road and bridges. This as Adenan Satem, the Chief Minister of Sarawak said was to ease the burden on the peoples of Sarawak especially in view of the escalating costs of living in the state. All this while the standard of Sarawak road is technically called 'trunk road'. 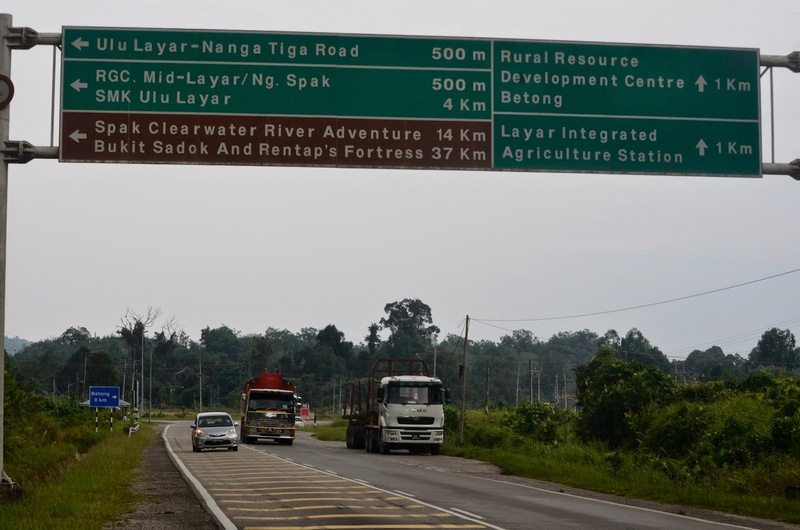 With the financial assistance from the Federal government, Sarawak is to see a proper highway and is planned to be completed in about 7 years time following closely the existing trunk road alignment. It has been 8 years since Daisy and Inul have traveled the Sarawak trunk road from Bintulu to Kuching and back. Their traveling feat has been recorded in a special blog called Hav Paws Will Travell. The cumulative distance achieved stands at 64,200 km and is equivalent to one and a half turn round the globe. (Earth circumference round the equator is 40,075 km). They have experienced traveling the trunk road on the average every monthly over the 8 years period. 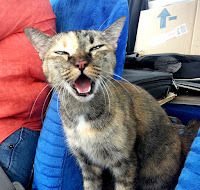 Follow this link to see images of the present state of Sarawak's trunk road and Mama Daisy and Inul's adventures. The Kambatik jungle gives an ambience of age-old mystery and popular folklore. There are very tall individual trees that grow to tremendous heights and below it are many more smaller trees that try hard and successfully find a corner in between other tree trunks to fit into the jungle architecture. The 'tarzan ropes' are lianas which are woody climbers and they can climb over many tall trees and in some instances can snap the top canopy of the 'host' tree by its dead weight causing the broken section to fall down or get suspended in mid air. Over time these broken branches will rot and enrich the forest floor with more organic matter. In the Kambatik jungle death is the source of new life. 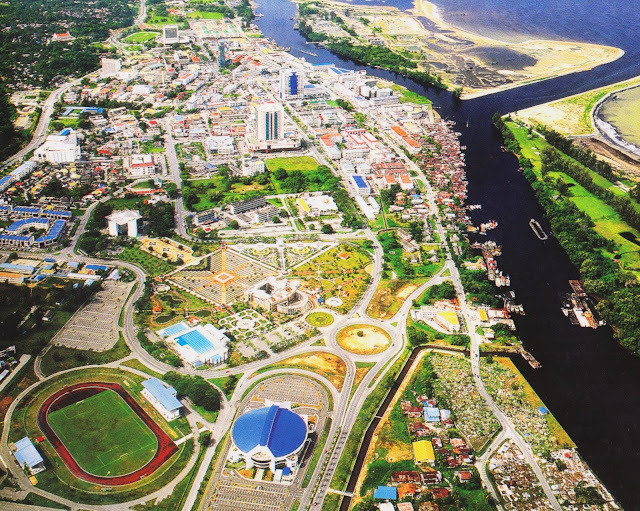 Ref: Chief Minister's Department, Kuching, "Sarawak - a pictorial journey of progress and development", 2012. There is a very interesting history of the development of electricity supply in Sarawak. It is made interesting if it can supply electricity to its neighbours especially the bigger region of Kalimantan Borneo, Sabah and the small kingdom of Brunei. 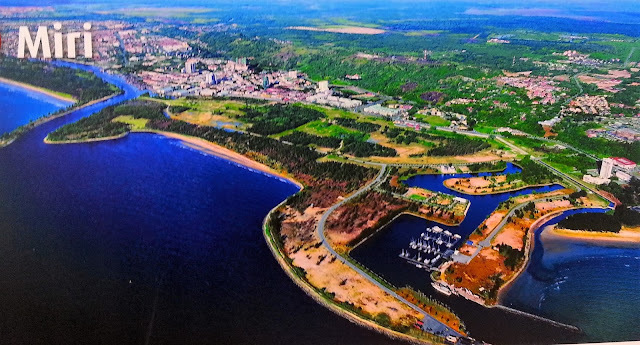 This history is made possible due to the huge source of electricity supply from Bintulu gas turbine generating stations at Kidurong and the hydro-electric Bakun and Murum dams at the hinterlands of Bintulu. 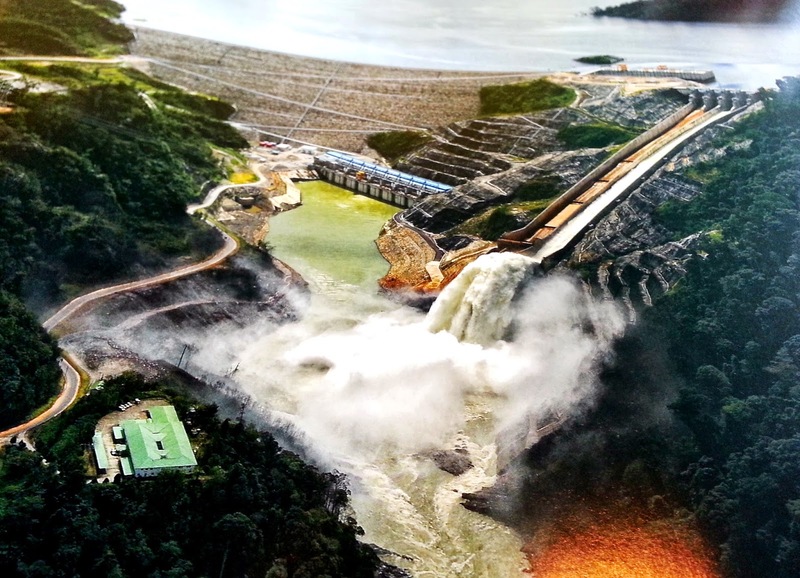 Bakun has progressively started to supply electricity since August 2011 and the Murum Dam (further up the Bakun Dam) will contribute late 2014. At present all access roads and overhead cable networks from both dams follow the road network from Bakun to Bintulu. 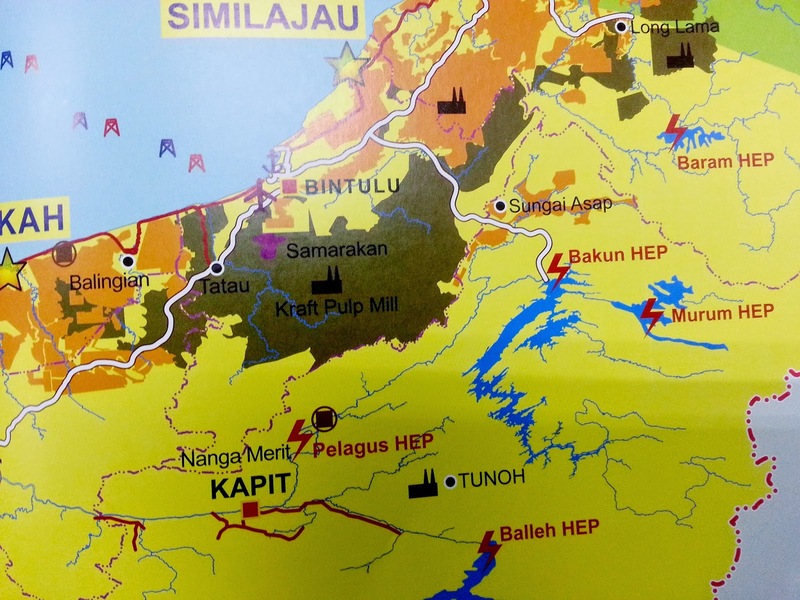 The electricity generated from Bakun is largely consumed by the industries at a new heavy industrial zone in Similajau region ( in the Bintulu Division) especially the industrial parks of Samalaju. Location of Bakun and Murum Dams in relation to Bintulu - its main consumer. This morning (8/11/14) I embark on blogging about the history of Sarawak. 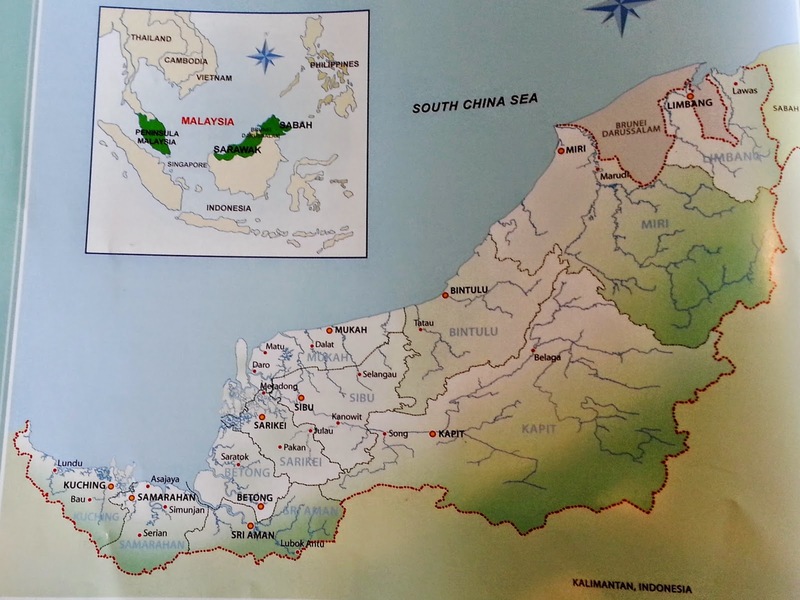 It is a big country, as big as Peninsular Malaysia. It is however in many respects a unique landmass that is endowed with rich resources from the open seas and coasts to the heavily forested mountain ranges. It would be a sad thing if its fascinating history is not available online or at the touch of the keyboard. In making more useful digital information available I have used the blogspot or blogger format since information contained in the blog postings can easily be googled worldwide. This blog is inspired by the developmental changes that occur in Bintulu and therefore the story of Sarawak will be re-constructed around the the concept of developmental history.